I was at a bar on Tuesday, waiting for Pete to play open mic. He was off talking to someone, so I decided to pick up the crossword puzzle. I actually did a lot better than the photo below makes it seem. I actually wrote one answer before I noticed 121 across and had to take a photo. Hmm, I thought. What does Pete get when he marries me? I was thinking they meant olden times where they were given livestock. But goat is four letters and the answer was looking for five. I didn't have any letters around it, and couldn't figure it out (so of course, I had to check the answer key). I won't tell you the answer just yet. I figured it would be more fun to guess. 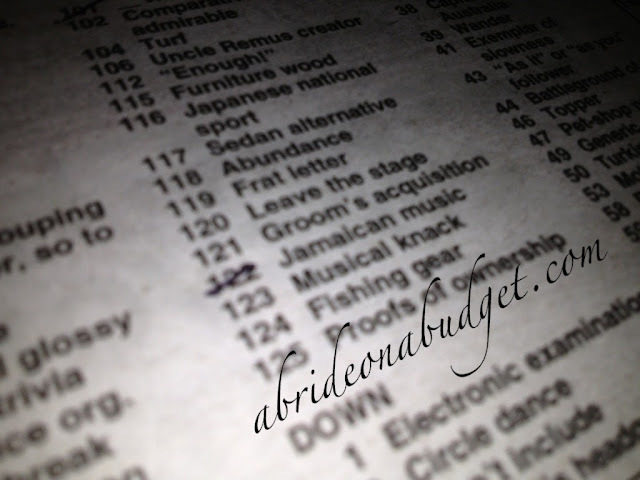 BRIDAL BABBLE: Grooms acquisition. Five letters. What do you think the answer is? Update: I just posted the answer here.